Tranidom Services is an organisation located in the commune of Credin in Central Brittany. I offer my experience and passion for animals to the service of owners of cats , dogs and other pet animals. Because of our service you no longer need do disturb your friends and family for the care of your pets while you are away. Call TRANIDOM Services the professionals. 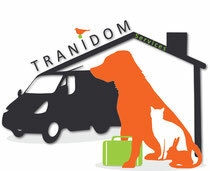 TRANIDOM Services is approved by Vetinary Services. We have worked together in order to offer you the best service possible for your pet.